Here in the UK, all businesses are required to submit their accounts, such as transactions, purchases and other financial information to the HMRC. For a small or medium-sized company, this can be a task which takes up a lot of your time, preventing you from doing other activities which actually grow your business. However, gathering financial information can help you learn more about how your company is doing, if you know what to do with it. There’s a lot you can do with just one set of numbers! Your financial data may seem innocuous, but it can hide useful information about how well you’re running your business. This article will show you a few simple ways that you can visualize your financial data to make decisions about your business, and act quickly. As you can see, the data which I’m going to use is quite basic, just two metrics with targets assigned to them. However, there are a lot of easy, effective ways you can make this data useful to you. Here are 4 of them, which you can create in Excel, but are far easier to do in software specially designed to visualize data. 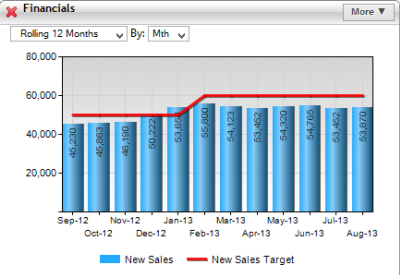 Using the New Sales Metric as an example, one of the ways you can use this data is by displaying it in a column chart. 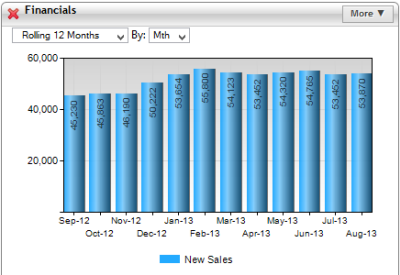 Using a column chart to display your data lets you directly compare your sales figures for each month. You may find that your sales are fairly steady, or perhaps that you had a boom in a particular month. Knowing this, you can see if you did anything differently that month (e.g. a new marketing campaign) and exploit it further. The beauty of charts in general is that they make a sheet of numbers instantly understandable, and the column chart shows this due to its simplicity. A line chart lets you see the direction which your data is heading, allowing you to spot useful trends in your data which would have been missed by just looking at the numbers. 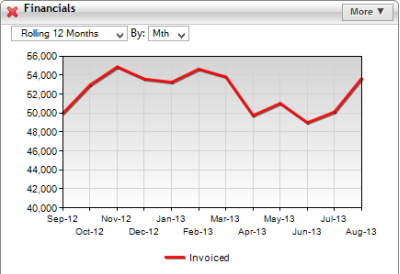 As you can see, I have shown our invoiced sales figures in this line chart. There has been a gradual decline in invoiced sales during the summer months, thought it appears to be recovering in August. This could mean that there has been an overall decline in business during that time (which could be the dreaded summer lull!) or it could simply mean that people need to be chased up to send invoices. Either way, this line graph lets users take action immediately to address the situation. Also, a line graph can be used alongside a column chart to provide two pieces of information which complement each other. Remember how we have both actual and target values for our finance metrics? Displaying actuals in a column and targets in a line lets us easily see which months have made the cut. A gauge is a visual indication of how a metric is doing at a particular point in time. By displaying your information in a gauge, you can keep track of current performance, but at the expense of performance over time. 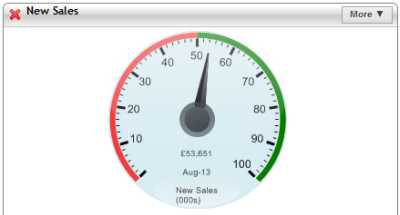 From the information on this gauge, our sales are in the green (i.e. on target) so all seems great! This may very well be the case, but we don’t know if sales were better or worse in July, so there is no context for this data. So, while a status indicator can be very useful, you need a little more information to make an informed decision. 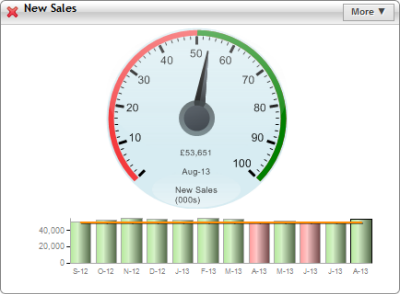 In this case, a dashboard program like Target Dashboard can be very useful; Not only do you not need to create a gauge manually, you also get a color-coded column chart to give you time based, understandable data to base your decisions on. If you have quite a few metrics that you want to keep track of, but haven’t the time for in-depth analysis, a scorecard can be the best thing for your data. A scorecard combines the best aspects of a gauge and a line chart, along with useful visual and numerical data. In this scorecard, you can see colored percentage change information between the last two months, as well as your target status. 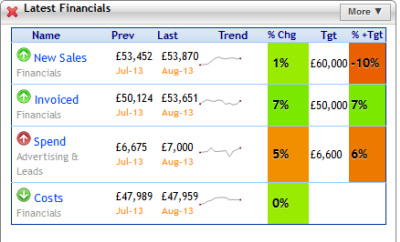 There is also a small sparkline which gives contextual trend info. These let you absorb a lot of information at a glance, making it perfect for quickly getting a handle on your metrics. All of this information is easy to read and compare for each of the metrics in the scorecard. Therefore, if you’ve collected a lot of information which you want to understand at a glance, a scorecard can work wonders for you. Using These 4 Visuals, Collecting Financial Information will Help You Make Decisions. Collecting financial information can be time consuming and stressful. But, you can make use of the data you collect through a few simple visualizations which will help you analyze data and make decisions. Column charts, line charts, gauges and scorecards all show you different information about your finances, so combining them will give you a full picture of what is happening in your company. You can also apply these visuals to other types of data (such as marketing). Managing a small or medium business often means that you have to make the best with the tools available to you. Therefore, I encourage you to experiment with these and other types of data visualization to make the most of the data you collect. 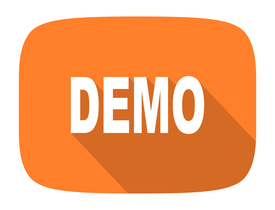 If you haven’t already, why not get a free demonstration of Target Dashboard, and see how easy it is to get started!